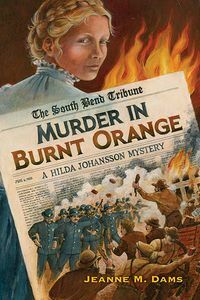 Murder in Burnt Orange by Jeanne M. Dams: Synopsis and Online Purchase Options. Synopsis (from the publisher): It's a heat wave in more ways than one in the summer of 1905, as strikes, arson, and train wrecks threaten the fabric of civilized society in South Bend, Indiana. In the tumultuous first years of the twentieth century, anarchy seems to rule, with the assassination of an American president and labor unrest like the Anthracite Coal Strike bringing misery to millions. How can a Swedish immigrant like Hilda Johanssson, formerly a housemaid and now pregnant with her first child, possibly affect these conditions? Making deductions worthy of Sherlock Holmes — and using her own "Baker Street Irregulars" — Hilda reognizes a pattern to the disturbing events. No one thinks she'll actually be able to solve matters, especially since custom forbids her even leaving the house. But they reckon without Hilda's quick mind and stubborn determination to see the job through — even when the crime wave turns into murder, and touches her nearest and dearest.